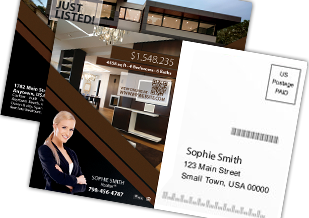 Real Estate Every Door Direct Mail Postcards to suit your specific needs. Send your postcards using targeted Every Door Direct Mail. We make it easy by helping you find the right people and mailing your postcards for you! as possible, all without a mailing list! Simply put, it’s a great way to reach more customers, increase revenue, while still keeping costs down. – No mailing list required (nor do you have to purchase a mailing list). – Pay postage prices that are a fraction of the cost of presort standard bulk mail (as low as 15.4 cents!). Realty Studio Design also offers a full Every Door Direct Mail EDDM service. We take care of all of the bundling, paperwork and delivery to the Post Office for you to save you the extra time and work involved with getting your EDDM mailers delivered. And the best part of all, postage prices are only 15.4 cents, and you don’t need a postage permit! 1. Simply provide us with the zip codes and carrier routes you would like. You may use USPS site’s tool to find these routes. 2. Then, send us an email at: [email protected] and we will create a unique direct marketing proposal for you. 3. Realty Custom design and printing Services will be included in the proposal. 4. After print, we will generate the postage statement and facing slips, bundle your postcards and deliver to the local Post Office of the area you wish to target. 5. Your postcards will be delivered to the targeted areas. Realty Studio Design Real Estate Every Door Direct Mail Postcards Service is the best solution to your direct mail campaigns. Your days can be busy and we understand that which is why we’ll stamp and mail your custom postcards for you! In just a few days, we can have all your EDDM postcards labeled, stamped, and shipped with no hassle on your end. 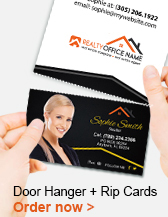 Every Door Direct Mail, EDDM Real Estate Templates and Every Door Direct Mail for Realtors. EDDM Postcards are a highly effective and efficient way to reach people at Realty Studio Design you’ll get the highest quality postcard printing, and delivered to your customers on time. Our custom postcards are printed on the same heavy 16pt card stock as our business cards in full color, double or single sided, with your choice of gloss or matte finish. Every Door Direct Mail, EDDM Real Estate Templates and Every Door Direct Mail for Realtors. Easily create an effective Real Estate Every Door Direct Mail Postcards Campaign using our EDDM Real Estate Templates, and we’ll take care of the rest! In just a few days your custom message will be in your customers’ hands. Real Estate Every Door Direct Mail Postcards | Every Door Direct Mail, EDDM Real Estate Templates, Every Door Direct Mail for Realtors, EDDM for Realtors. GET STARTED TODAY!